(Oxford, 26 November 2016) 200 pp. Reviewed by Peter Womack on 2017-07-29. Publishing this book is an odd thing for Oxford University Press to have done. Since 2000 it has been generating a monumental academic edition of The Complete Works of Oscar Wilde, with Volume 8 due out late this year. At first sight, the present book seems to be a volume in that series: like the others, it is an imposing Oxford hardback edition of a text by Wilde, carefully edited and generously annotated. However, it turns out that this book is not part of the Complete Works; rather, it is a sort of appendix or postscript, neither quite integrated with the main project nor quite independent of it. Reviewing the book, then, entails addressing the unexpectedly tricky question of what it actually is. Not long after taking his Oxford degree in the summer of 1878, Wilde decided to go in for the Chancellor's Essay Prize, an annual competition still held today. Every year there is a set topic, and that year it was "Historical Criticism among the Ancients." Wilde wrote an essay of a little under 25,000 words on this subject, which did not win the prize (it is possible that he did not ultimately submit the essay), and was not published in his lifetime. Surviving in manuscript, it first appeared in print, after some heavy-handed editing, in Robert Ross's 14-volume Collected Works of Oscar Wilde (1908). While Wilde was working on this essay in 1878-9, he kept a notebook in which to put quotations, ideas, and drafts. The notebook found its way into the collection of Wilde materials that was amassed by Viscountess Eccles and bequeathed to the British Library on her death in 2003. This is the document that OUP has now reproduced in print, with exhaustive explanations of its allusions and minute descriptions of its lacunae and marginal scribbles. Operating, then, at a high level of scholarly obscurity, this book enshrines the preparatory notes for an unpublished student essay. Or, to be more precise, some of the notes for a draft of an unpublished student essay -- since the textual scrutiny attendant on the publication has suggested both that there were other notebooks which have not surfaced and that the text of the essay itself is not quite a fair or final copy. The fragmentary text that results cannot plausibly be represented as something from Wilde's oeuvre; it is more like something from his waste paper basket. That makes it fair to ask whether the waste paper has anything written on it that rewards the labor of retrieving it. But before we get to that question there is another layer of context: the interlocking editorial activities that have now come to surround these primary texts. Systematically edited for the first time, Wilde's essay on historical criticism appeared in the new Oxford Complete Works, volume 4 (2007). The editor, Josephine Guy, annotated it copiously, tracing its sources in both classical authors and nineteenth-century historians and philosophers. This was a necessary operation, since the essay is both impressively learned and completely devoid of footnotes. Guy was much assisted in her task by Philip E. Smith's own earlier work. In 1989 he and Michael S. Helfand edited two other student manuscripts as Oscar Wilde's Oxford Notebooks: A Portrait of a Mind in the Making. Since these notebooks reveal a great deal about what Wilde had been reading and what he had been thinking about it, Smith and Helfand's researches flowed naturally into Guy's commentary. But she made no use of the then unpublished "Historical Criticism Notebook," either because she judged it unhelpful or was unaware of its existence. The trouble with this sequence of events is that the newly published notebook is really intelligible only in specific relation to the essay. Whereas the other "Oxford Notebooks" were more like general commonplace books, collecting miscellaneous thoughts and quotations, the "Historical Criticism Notebook" is a working document from a single academic project. As Smith more or less warns at the outset, one needs to have the Oxford edition of the essay always open next to it: to an unusual extent, this book does not stand alone. Its ideal reader would be someone preparing a scholarly edition of the essay, but alas, it has come too late for that. Since the notebook mostly contains drafts of sentences and paragraphs that will arrive at their final form in the essay, annotating the notebook mostly means dealing with exactly the same materials as annotating the essay, so that Smith is perforce treading, step by step, in Guy's footmarks. When he occasionally manages to fill in one of Guy's gaps or correct one of her errors, he does so with a slightly unnecessary emphasis. For a while I thought I could detect a note of Casaubon-like resentment at being investigatively outrun, but that is probably unfair. Rather, what I could hear was the relief of having, for once, something independent to do. Smith's project seems painfully fenced in. For too much of the time, all he can do is confirm that Wilde was indeed on the page of Buckle or Polybius that he already seemed to be on. What we are left with, in other words, is an exhibition of rigorous erudition lavished upon an object that seems inadequate to it. First, the "Historical Criticism Notebook" can illuminate nothing but the "Historical Criticism Essay," and in practice the notebook tells us little about the essay that the essay does not tell us about itself. One might object that any material contribution to the understanding of Wilde's canonical writings is valuable, however marginal it might be, and that cashing out that value is the business of the next generation of critics. But this argument makes a large assumption about the essay's importance. And here, I would say, is the real point of this publication: not so much its utility to Wilde scholars (who would perhaps be as well served by the digitization of the original), but its dramatization of the idea that "Historical Criticism" itself is a major work. Smith and Helfand were already advocating that view in the long and persuasive introduction to their 1989 edition of the other Oxford notebooks, and it is clear from his acknowledgments in this new book that Smith has been energetically on the case for many years. What is at stake is the shape and scale of the Wilde canon: is it so important, and so coherent, that even the most indirect evidence of its genesis deserves this minute attention? "Historical Criticism" is after all a serious piece of work, which is itself an interesting fact given the damage Wilde was later to inflict on that very adjective. It interprets the title -- "Historical Criticism among the Ancients" -- as an invitation to trace the emergence of a critical spirit in classical Greek historiography, which it does through careful readings in Herodotus, Thucydides, and Polybius, as well as in Plato and Aristotle. This procedure opens up several large themes: the tension between idealism and empiricism in the philosophy and practice of history; the way modern methodological debates are prefigured in Hellenic culture; and the Hegelian narrative according to which the human spirit progressively works out its freedom. The seriousness with which Wilde takes up these questions -- a seriousness which is certainly underlined by the Notebook's evidence of his industrious preparations -- is ammunition to use against readers who regard him as a sort of high-cultural jester on the strength of such texts as "The Decay of Lying" or the "Maxims For the Instruction of the Over-Educated." On the contrary, if we read the later writings in the light of this early essay on historical criticism, Wilde arguably takes his place alongside Arnold or Ruskin in the great Victorian debate about culture and society. A passing reviewer is hardly positioned to say just how convincing this argument is. But Smith's work prompts one sceptical reflection: unlike Wilde himself, this way of affirming his significance pays too little attention to the question of audience. As Regenia Gagnier pointed out a generation ago (in Idylls of the Marketplace, 1986), Wilde's ambiguities often reflect his efforts to reach discrete if overlapping publics. The literary monthlies, the West End, the American lecture circuit, and the Uranian subculture all traded in different and incompletely convertible intellectual currencies. But the currency of "Historical Criticism" is exceptionally self-contained and easy to label: it is that of Oxford University. The intended readers are the judges of an Oxford competition; the dominant texts, the characteristic questions, and the Hellenism all come from the syllabus of Oxford Greats in the era of Jowett. At age 24, having just graduated with a first-class degree, Wilde may well have been thinking of aiming for a college fellowship. If the essay was serious, then, it partly expressed the seriousness of a student trying for top marks. And if it is now being oversold, as I am inclined to suggest, it is partly because the sellers are professional academics working with a distinguished university press. The appropriateness of it is a little comical: Wilde today may be a world-famous wit and gay icon, but we in the Faculty are not fully convinced of his importance until he appears, also, as an exemplary graduate student. And there is indeed something a bit bon enfant about the essay's formulations. The young classicist deplores the Greeks' "fatal legacy of a mythology stained with immoral and monstrous stories imputing evil and sin to God" (Notebook 75; see also Complete Works 4: 5-6), and shakes his head at the way later Hellenic historians valued style above the scientific evaluation of evidence (CW 4:41, Notebook, 15). It is hard to imagine the London Wilde concurring even though these sentiments were once definitely his own, for there is no sign that heterodox views expressed in the notebook are suppressed in the fair copy of the essay. On the whole, the personal touches in the fragmentary notes -- the occasional Paterian purple patch, the occasional joke -- survive into the final draft; the candidate, you might say, is exhibiting flair as well as conscientiousness. But the discursive requirements of a particular intellectual genre lead Wilde to say certain kinds of thing. It is not unconnected with his subsequent trajectory: he presents himself as the product of a classical education, from which he will go on to become a poet, dramatist, and cultural journalist. But the connections are not straightforward, because he was never in the same situation again. I have implied that the notebook is of limited interest because most of its substance can also be found in the essay, which is for obvious reasons more readable. This is not entirely true, for some of the particular starts and trains of thought in the notebook did not lead to anything in the completed work. Only the notebook, for instance, includes a rather reverberant reflection on the way Tacitus and other imperial historians like writing about criminality (126-7). More generally, as compared with the finished essay, the notebook shows more emphasis on two related questions: what do historians do when their sources include evidently fabulous or miraculous narratives, and how far do historians admit of divine or providential interpretations of events, rather than depending on wholly naturalistic types of causation? The notebook thus rather surprisingly embeds the "Historical Criticism" essay in the classic mid-Victorian antinomies of faith and rationality. This move could have sprung from both larger and smaller causes. A small one is that despite his glittering First, Wilde had failed an exam in Divinity and had to resit it at the time he was working on the essay. A larger one is that 1870s Oxford was a historically ecclesiastical institution in the difficult process of secularizing itself, and Wilde, arriving from the confessional complexities of Dublin, could see that controversies in current Christianity were everywhere implicit in Oxford's overtly classical curriculum. However that may be, this large silo of scholarly labour seems here to yield at least one fruitful grain of suggestion: when, less than a year later, Wilde burst upon the world as an aesthete (see below), he was really conducting a dialogue with religion. 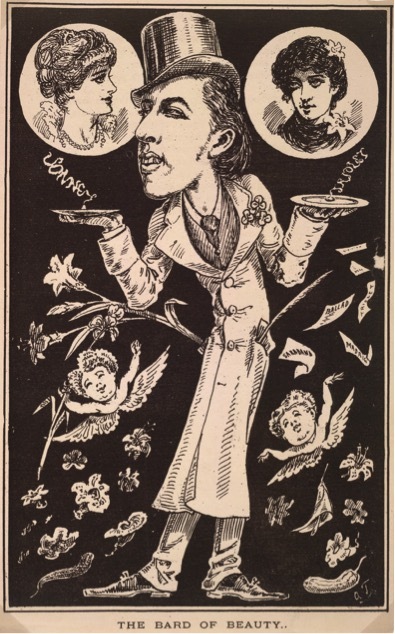 Oscar Wilde as the Bard of Beauty (April 1880). Creator unknown. Peter Womack is a Professor in Literature and Drama at the University of East Anglia, Norwich, England. Leave a comment on Peter Womack's review.